The blanket has doubled in size since yesterday. 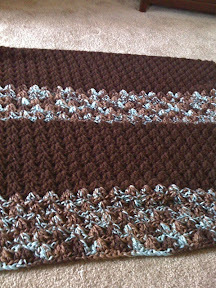 Just one more brown section and then I'm done--but I just ran out of brown yarn. Dang. I knew thee skeins weren't going to be enough but that was all Wal Mart had on Thursday. Here's another view. It's coming along. I'm going to go shower and then the monkeys and I are going out to get candles. We haven't carved our pumpkins yet but it's this afternoon's scheduled activity. I'm sure I'll have some fabulous pictures for you later. 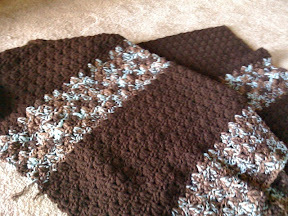 Wow, I love those colors together...is this the pattern you were mentioning is so easy to do?